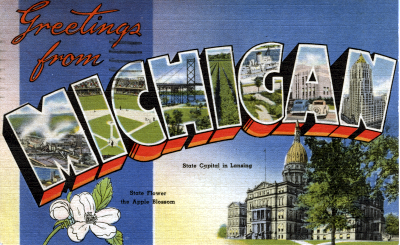 Michigan became a state on January 26, 1837. Today almost 10 million people live in Michigan, and we rank as the 8th largest state in the country. We’re a unique state for many reasons, including the fact that Michigan is the only state made up of two peninsulas (the Lower Peninsula and the Upper Peninsula), and we touch four of the five Great Lakes! (Do you know which ones?) We’re world famous for our beautiful beaches, our cars, and tart cherries! 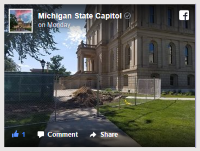 Did you know that Michigan’s Capitol is 267 feet tall? Brush up on Capitol facts here! Did you know that the Michigan State Flower is the apple blossom? Brush up on Michigan facts here! The Michigan Legislature publishes a variety of free booklets for students including coloring books and information about how laws are made. Check it out here! This colorful Michigan postcard printed about 1945 includes images of (from left to right) a factory, a baseball diamond (probably Tiger Stadium), the Ambassador Bridge, a farmer’s field, a freighter, Detroit’s famous Fisher Building, and, of course, the Capitol!